Your host at the hotel "Le Balmoral"
At Balmoral, we care about the well-being of our clients. Therefore, we prefer a tailor-made welcome, a discreet and efficient service, so that everyone feels "at home". The most? Our restaurant with its plunging sea view. A beautiful seafront hotel just a stone's throw from Menton old town. You’ll love this quiet, charming hotel just a few minutes from the old centre of Menton, whether your room overlooks the sea or the pedestrian street. You are guaranteed a relaxing stay at this Menton hotel, with its garden terrace, sun lounge, panoramic seafront restaurant and beautiful spacious and air-conditioned rooms. And if you want to leave this haven of tranquillity... you can enjoy gentle walks around Menton or visit the many museums and flower-filled parks. This late 19th century hotel, where Sarah Bernhardt stayed, was designed to welcome the sun... The works of artist Traquandi feel particularly good, the light exalting their colours and the velvety surface of their surfaces. Everything has been designed to make you feel at home, and you can also enjoy the services offered by our attentive staff. Relax in your comfortable, spacious and tastefully decorated room during your holiday in Menton. The hotel's excursion programme is perfect for those wanting to experience the culture of the Côte d’Azur, on both sides of the Italian border and inland in its hilltop villages. Both our Menton hotels, Le Balmoral and Le Royal Westminster, house the works of some fifteen artists. Their paintings, watercolours, silkscreen prints and sculptures offer a wonderful overview of the many different artistic trends represented in the Vacances Bleues collection. 1 hotel/1 artist: Gérard Traquandi. Le Balmoral showcases a selection of works illustrating some of the artist's favourite themes, whether inspired by nature or variations based on the old earthenware jars you can find in the gardens of Menton. This wonderful late 19th century Menton hotel still resembles a large family residence. Regular visitors find the hotel's welcoming atmosphere a great place to meet. It was here that the actress Sarah Bernhardt stayed when she visited the Côte d’Azur and today it is home to the works of the artist Traquandi; his works are bathed in a light that heightens the colours and the velvet texture of the materials used. Essential single rooms on the city side or sea view (13 m2). A good plan in a beautiful place! Need more space: choose a Superior room with balcony. The hotel has 69 rooms (including 7 superior double room) on four floors and in two buildings. The air-conditioned rooms have televisions and bathrooms with either bath or shower. Three rooms are specially equipped for persons with reduced mobility. The building has a lift. Enjoy the light, inventive and seasonal cuisine prepared by our chef and served in our elegant panoramic restaurant, L'Horizon; you can eat in the air-conditioned sea-view restaurant or on the terrace during summer. Whether you are full-board or half-board, enjoy the table service provided by our attentive restaurant staff, who are only too happy to serve you. Breakfast 7.15 to 10 a.m. Lunch 12.15 to 2 p.m.
Dinner 7.15 to 9 p.m.
Extension of bar breakfast service to 11.30 a.m., wine list, à la carte restaurant service. The bar "Les Palmiers" and its terrace overlooking the sea welcome you for a moment of relaxation and idleness. If one of your excursions takes you to Nice, come and visit our Côte d’Azur restaurant hotel: Hôtel le Royal, on the Promenade des AIf one of your excursions takes you to Nice, come and visit our Côte d’Azur restaurant hotel: Hôtel le Royal, on the Promenade des Anglais. Discover and visit Menton, the pearl of the Côte d'Azur! Discover the museum collection Séverin Wunderman 100 m from the hotel, the Bastion, the wedding hall of Menton and the many monuments of the region sheltering the artist's works, frescoes and mosaics. Behind the shutters that screen the sun 315 days a year, discover the historical heart of Menton, labelled "City of Art and History". Jean Cocteau's universe: the Séverin Wunderman collection museum, the Bastion, and the numerous monuments of the region housing the artist's works. Baroque art gave rise to a remarkable ensemble in Menton: the forecourt of St. Michael's Basilica and the chapel of the White Penitents. Unrivalled views of the old town, the sea and Italy from the Old Castle cemetery. Les collines mentonnaises, the oil mill of Castellar, Saint-Agnès and its lemon pie. Nice Carnival:"The King of Cinema"
Illuminated corsos, parades, giant parades day and night, flower battles, 1,000 musicians and dancers from all over the world... Live the carnival 2019! 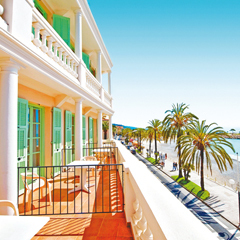 You can organise your own programme of outings in Menton and the region. Le Balmoral offers its Kiosk service, in which you will find all the documentation on tourist sites and places of interest. Ask our team to inform you and guide you towards the activities adapted to your desires! The Kiosk also serves as a ticket office: you can buy hotel tickets for certain tourist sites at preferential rates. The ExThe Excursions service offers a broad programme of excursions that differs from week to week, so you are sure to find the perfect excursion(s) for visiting the Côte d'Azurfrom your hotel base. Our excursions are available all year round (except November) and are accompanied by helpful, qualified guides. Our excursions are either full-day or half-day and are 'all-inclusive' (lunch and drinks are included for full-day excursions). Half-day: Bordighera, Bussana, San Remo, Dolce Acqua Cannes, Eze and The three Corniches, Isolabona, Roquebrune, Monaco, Nice, Vallauris, Antibes, Grasse, Vence, Villefranche-sur-Mer and Vintimille..
Full-day: Cannes and the Lérins Islands, Tende and the Valley of Marvels, Boréon, the River Vésubie and the Mercantour National Park, Grasse, Monaco, Genoa and Liguria. Our Excursions service in Nice also offers tailor-made tours for those who would like a customised programme. Although quiet, Menton loves a party, and entertainment plays an important role in the life of the town. Our motto: one month = one event showcasing Menton's exceptional heritage. February: the magnificent Lemon® Festival. May: the Rencontres franco-italiennes de théâtre de rue (French-Italian street theatre) fill the town centre with commedia dell’arte. July: the Menton Festival Sports Plaisance (Yachting Festival), where fun and thrills are guaranteed! October: the Penser Notre Temps (Thoughts on Our Times) symposiums, with public conferences and debates every Saturday in the month. A8 motorway, Menton exit, direction town centre. At the Casino, take the seafront road (Promenade du Soleil) 300 m on the left. Bastion car park 100 m from the hotel (approximately € 63/week; reception will give you a magnetic card against a € 30 deposit; information from the hotel reception). Nice/Côte d’Azur Airport, then taxi to Menton or Airport bus. Express: Menton-Airport shuttle Leaves every hour. Menton station then taxi. Nice station then taxi. Tourist tax: rate determined per person and per night, which may be revised during the year according to municipal regulations. Lemon Festival: 2 events are included in the price of 2 stays of 7 nights from 17/02 to 03/03/2018. Possibility to buy events on site. One excursion free for all reservations from 06/01 to 17/02 and from 03/03 to 31/03 2018, included in the stay 7 nights. Room with sea view: additional fee of 13€/night. Superior room: additional fee of 10€/night. Single room city - Essential: free. Single room sea - Essential: additional fee of 28€/night. Double room occupied by 1 person: additional fee of 20€/night. 20% off the adult rate for children from 2 to 11 years old. For stays 7 days/7 nights from 14 to 21/04 and from 29/09 to 06/10/18. Return transport by bus: 172 €/person.